The second issue of Kitsune is here! If you missed the first issue, you can find it on the Ronin Institute website. If you are not on the mailing list (maybe you’re looking over someone’s shoulder right now at Starbucks), but you would like to be, just send us an e-mail at kitsune@ronininstitute.org, and we’ll add you. Now, on with the updates. A small but dedicated group of hardy Ronin braved the Boston blizzards to the meetup at a cafe in Porter Square, Cambridge, MA. Convened by Alex Lancaster it featured a wide ranging discussion that included individual research interests, trends in academia, and ideas for further developing and promoting the Ronin Institute model for research.Amongst other topics, Anne Thessen discussed her positive experiences as the first applicant to submit an NSF grant via the Ronin Institute, and highlighted the positive response of her more traditional colleagues (even those with tenure) towards the Ronin model. She also discussed setting up her scientific consulting company, The Data Detektiv.Lucas Mix wondered how we might build an even better business case for the Ronin Institute by considering the point of view of a funding agency. There was general agreement that the lower-overhead model of Ronin would be attractive to those agencies, but also that more work would be required to make that case even more compelling.We hope to hold another New England meetup in the Spring and/or Summer and anticipate that we will attract even more Ronin, especially once the snow and cold has retreated. A friend once pointed out that science in the US is structured so that as people become more accomplished, they stop doing science, and start deciding what science should be done. As a graduate student or postdoc, your time is devoted to research. As a professor, you spend more and more time writing and reviewing papers and proposals, and, of course, building and managing a group of students and postdocs of your own.Directing the research of your group may be the most demanding and time-consuming of the activities that come with a faculty position, but, as many people will tell you, it is one of the most necessary. Most universities and departments expect you to train students and postdocs, partly to contribute to the educational mission of the institution, and partly to ensure that you are bringing in the funds to support those folks (and the associated overhead). But more than that, most faculty feel that they can not be productive enough without directing (and receiving credit for) the work of several researchers. The thing is, they’re probably not wrong. Few science faculty would pass their tenure review on the basis of the work they were able to do with their own hands. And even people in jobs that don’t require building a group may feel a longing to do so. We all have more ideas than we have time to pursue, and the appeal of having bright young people to follow up on those ideas is obvious.This is not to say that education and training are not genuinely important, but the numbers are completely out of balance. In fields where academia is the major employer, at steady state, each faculty member should train on average one graduate student during the entirety of their career. Even if we allow that there are a certain fraction of non-academic jobs available to students, faculty should be training maybe one student per decade. If your goal is to “build a group” of even three or four graduate students, you’re looking at training a couple of dozen students over your career — far in excess of what will be necessary to replace you. This, of course, feeds into the often-discussed overproduction of PhDs (and postdocs). Moreover, it creates a positive feedback loop. Too many PhDs means a crowded job market. A crowded job market means more competition, and higher expectations for faculty productivity. Those expectations create pressure to recruit more students and postdocs, which creates further excess. Maybe you’re rankling at this argument, because, after all, you’re a hero for training the youth of today, preparing them for the brave new world of tomorrow. You genuinely believe that when you accept a student into your lab, you are doing them a favor. And the student probably feels the same way. But here’s the thing. In all the years I have spent doing science, and hanging around scientists, there have probably been hundreds of times when someone said, “I should find a student to work on that”. In NONE of those cases did that mean, “Here’s a project with real pedagogical value, where a newcomer to the field could really do some good work that would set them on the path to being a productive and independent scientist”. Not once. Invariably, what is meant is something like, “I don’t have time to work on this myself, and I don’t have the resources to pay market value to someone with the skills to do the work, so I’ll find someone who will do the work on the cheap”. Sometimes, there is also a bit of, “If I find someone to do this work who has significantly less standing in the field than I do, that will ensure that most of the credit for this work accrues to me, rather than the person actually doing that work”. Of course, the extent to which the relationship between student and professor, or between postdoc and advisor, is exploitative varies enormously, both field to field and lab to lab. Some people are very conscientious in the way they train people, and they work hard to make sure that their students and postdocs receive credit for their research. But there is nothing in the system that requires faculty not to exploit the people in their groups, and exploitation can lead to tangible rewards. The papers that students write and the grants that support them show up on the balance sheet that leads to named professorships and other tokens of prestige that constitute the carrot-and-stick system that universities use to maximize their own exploitation of their faculty. Obviously, we should not abandon the goal of training and educating young scholars. But we all need to think more carefully about how and why we take on students and postdocs. We talk about academic “pedigrees”, and there are many ways in which the advisor-student relationship is like a parent-child relationship. That’s maybe a good place to start. People have children for a whole host of reasons. The people who have children because they want to take on the responsibility and reward of nurturing someone — who are willing to sacrifice their own needs and desires in order that their children can develop into their best selves — those people make great parents. People who have children because of external pressures and expectations — or because they believe that their child will have an obligation to love and respect them — those people make terrible parents. So before we admit another graduate student or hire another postdoc, we need to be asking ourselves why we’re doing it. Is it because we feel that it will be rewarding to devote our time and energy to helping someone else develop the tools to carry on the quest for knowledge — to go further in the future than we have been able to go? If so, great! Let’s do it! But if we’re taking on students because we want some cheap labor to follow up on leads we don’t have the time or patience to pursue, or if we’re taking on students because we’re desperate for something to write in the “Broader Impacts” section of our grant proposal, or if we’re taking on students because a dean or department chair thinks that labs should be a certain size, well, then we’re actually contributing to the problem. Taking those students may be the prudent political decision. It may be the smart career move. But we should at least recognize that we’re benefitting from and perpetuating a system based on disingenuous promises and exploitative power asymmetries. In the upper right-hand corner of the newsletter, you can see the official Ronin Institute logo. Like the logos of many universities, our logo is designed to capture the core values that the Institute represents. But unlike logos featuring simple slogans like “Veritas” or “Let There Be Light”, our logo may not be entirely self explanatory. So here is a full-on exigesis of the logo’s various elements. In feudal Japan, if a Samurai lost their master, tradition required that they commit suicide. Those who chose not to kill themselves became masterless Samurai, or Ronin. These Ronin would wander the countryside, working as mercenaries or bodyguards, or, in the best incarnations, meting out justice. The paired swords were emblematic of the rank and rights of the Samurai. Ronin were those who said, “I have earned my swords, and I have a right to wear and use them, with or without a master”. Similarly, in feudal contemporary academic culture, there is an expectation that if you don’t work in one of a small number of traditional careers (e.g., a research university or government laboratory), you don’t have a right to participate in academic scholarship. If you don’t have a master, you are expected to commit career seppuku. But if you’ve been trained in research, and you’ve become a world-class expert on some topic, we believe that you have earned your swords, and that you have a right to weild them, with or without a master. Our motto, Scientiam Consecemus, is a call to arms to those who have earned their swords to grab them and to rejoin the fray of academic scholarship. It is a Latin translation (courtesy of Research Scholar Kristina Killgrove) of “Let’s Chop Up Some Knowledge”. When we first revealed the logo, one commenter noted that the swords look a bit like dental picks. This was not part of the intended design, but discovery requires being open to serendipity. Serendipitously, good oral hygiene is also one of the Ronin Institute’s core values. The outer structure of the logo is reminiscent of emblems used by various entities within the United States federal government. While we don’t necessarily share all of the same goals and methods of these agencies, federal support of scholarship, particularly in the sciences, has been one of the primary drivers of discovery, particularly over the past seventy years. The sequence of numbers 12.19.19.2.8 at the bottom of the logo is the founding date of the Institute, on the Mayan calendar. The stars are part of the “federal” look. There are forty-two of them because that’s the answer to life, the universe, and everything. You might have thought this was just a bunch of squiggles put in to fill up the white space betwen “Ronin Institute” and “Scientiam Consecemus”. Actually, it is a statement of our philosophy of valuing transdisciplinary and high-risk research and non-traditional careers. We encourage scholarship that falls outside of the boundaries of traditional academia and in the spaces between traditional departments and disciplines. We also strive to increase the diversity of scholarship, both in terms of who is able to participate as a scholar and in terms of how they pursue their questions. It reads “Infinite Diversity in Infinite Combinations” (IDIC), written in the Vulcan ceremonial calligraphic script, vanu-tanaf-kitaun. The atomic structure of Promethium, which was chosen not only for the fact that it has the third largest atomic radius among the lanthanides, but also for its name. It is named, of course, after Prometheus, the Titan who stole fire from the Gods on Mount Olympus and entrusted it to humans. Because knowledge belongs to everyone. In the upper right is the Chinese character di(4), meaning “truth”, in the sense of “meaning” or “significance”. In the lower left is the Sanskrit word satya, also meaning “truth”, but more in the sense of “reality”. Together, these symbolize the centrality of the search for truth as the guiding principle for scholarship. Understanding “truth” requires not only that we discover the nature of reality, but that we understand the significance of that reality. Finally, in the lower right, we have one of the Adinkra symbols created by the Akan people of West Africa. This particular symbol represents Nea onnim no sua a, ohu, or “He who does not know can know from learning”. Whether you are a scholar or a student, learning is not only a lifelong opportunity, but a lifelong obligation. 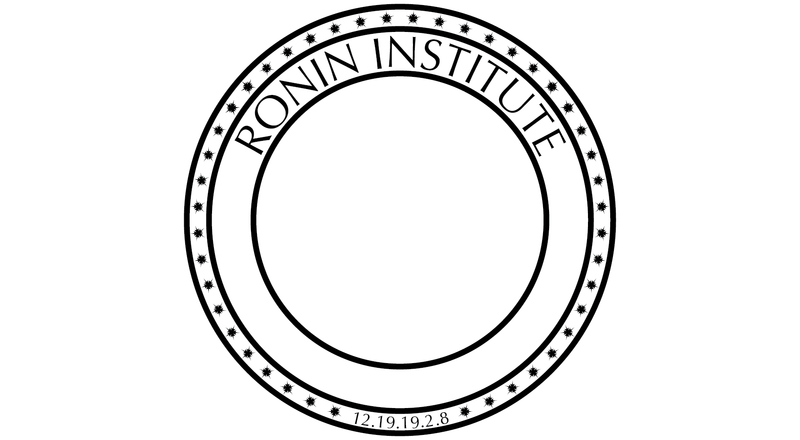 So there you have it, the Ronin Institute logo, in all its multi-cultural, symbolism-laden goodness, and the core values that that we (and maybe you, also) stand for. Last month, we received our first distribution from the Amazon Smile program, and we would like to thank all of you who used that to do your Amazon shopping. If you have not been using it, Amazon Smile is a program where Amazon will donate 0.5% of what you spend to the nonprofit of your choice. The trick is you have to go to Amazon Smile and select the Ronin Institute as your designated charity. Then, set that link up as a bookmark, because it only works if you shop using the “smile.amazon.com” URL. Coughlin, M. M. (2012) One Colonial Woman’s World: The Life and Writings of Mehetabel Chandler Coit University of Massachusetts. Battle-Fisher, M. (2015) Applications of Systems Thinking to Health Policy and Public Health Ethics Springer. Rohwer, F. L., Youle, M., Maughan, H., & Hisakawa, N. (2014) Life in Our Phage World: A Centennial Field Guide to the Earth’s Most Diverse Inhabitants Wholon. Smith, E. and Krishnamurthy, S. (2015) Symmetry and Collective Fluctuations in Evolutionary Games IOP Science. Carr, L. M., Waddell, P. J., Gemmell, N. J., & Penny, D. (2015) Analyses of the mitochondrial genome of Leiopelma hochstetteri argues against the full drowning of New Zealand. Journal of Biogeography. Hilbert, Y. H., Parton, A., Morley, M. W., Linninlucke, L. P., Jacobs, Z., Clark-Balzan, L., Roberts, R. G., Galletti, C. S., Schwenninger, J.-L., and Rose, J. I. (2015) Terminal Pleistocene and early Holocene archaeology and stratigraphy of the southern Nejd, Oman Quaternary International doi:10.1016/j.quaint.2015.02.053. Hruschka, D. J., Branford, S., Smith, E. D., Wilkins, J., Meade, A., Pagel, M., & Bhattacharya, T. (2015) Detecting regular sound changes in linguistics as events of concerted evolution Current Biology, 25(1), 1-9. Marks, A. E. and Rose, J. I. (2014) Through a prism of paradigms: a century of research into the origins of the Upper Palaeolithic in the Levant Néandertal / Cro Magnon. La rencontre, edited by M. Otte. Liege: Eraul, Pp. 63-93. Murren, C. J., Auld, J. R., Callahan, H., Ghalambor, C. K., Handelsman, C. A., Heskel, M. A., … & Schlichting, C. D. (2015). Constraints on the evolution of phenotypic plasticity: limits and costs of phenotype and plasticity Heredity. Quintero, E., Thessen, A. E., Arias-Caballero, P. and Ayala-Orozco, B. (2014) A statistical assessment of population trends for data deficient Mexican amphibians PeerJ 2: e703. Rose, J. I. and Hilbert, Y. H. (2014) New Palaeolithic sites in the southern Rub’ al Khali desert, Oman Antiquity 88(381): Project Gallery. Rose, J. I. and Marks, A. E. (2014) ‘Out of Arabia’ and the Middle-Upper Palaeolithic transition in the southern Levant Quartaer 61:49-85. Sundberg, C. W., Kennedy, T. and Odell, M. R. L. (2014) Weather, climate, Web 2.0: 21st century student speak climate science well Journal of Interactive Online Learning 12. Appelbaum, P. (2014) The Life and Death of the Radical Historical Jesus. By David Burns, New York: Oxford University Press, 2013. Church History, 83, pp 794-796. Kramp, J. M. (2014) Counseling Muslims: Handbook of Mental Health Issues and Interventions. Edited by Sameera Ahmed and Mona M. Amer. New York: Routledge, 2012. Religious Studies Review 40.1: 18-18. Kramp, J. M. (2014) Lucy in the Mind of Lennon. By Tim Kasser. New York: Oxford University Press, 2013. Religious Studies Review 40.1: 18-19. Kramp, J. M. (2014) Spiritual Care at the End of Life: The Chaplain as a “Hopeful Presence”. By Steve Nolan. London: Jessica Kingsley Publishers, 2012. Religious Studies Review 40.1: 19-19. Callier, V. (2014) Doug Emlen’s Animal Weapons Science 346:1305. Andrews, K. M., Donesky, A., Ford, R., and Mathis, J. E. (2014) White Paper — Hemp: An Energy Crop to Transform Kentucky and West Virginia. Callier, V. (2014) Separate Training from Research Budgets, October 7, 2014, The Scientist. Callier, V. (2015) Opinion: Out with the Old, January 21, 2015, The Scientist. Callier, V. (2015) Overspending on Overhead, February 1, 2015, The Scientist. Callier, V., Singiser, R. H., and Vanderford, N. L. (2014) Connecting undergraduate science education with the needs of today’s graduates [v1; ref status: indexed, http://f1000r.es/4pl] F1000Research 3:279. Callier, V. and Vanderford, N. L. (2014) PhD trainees should be empowered to leverage dueling priorities. Biochemistry and Molecular Biology Education 42.6 (2014): 455-456. About the Ronin InstituteThe Ronin Institute is dedicated to building an alternative model of academic scholarship outside of the traditional university system. To learn more, visit us at http://ronininstitute.org or send us email.